Over the past few years the cladding market has matured and we are seeing specifiers demanding more from cladding as they want a product which not only looks good but is durable and long-lasting. There seems to be a move away from natural finishes and a growing number of our instructions are specifying surface finishing or treatment. Timber cladding is mainly being used in the new build market, although it is becoming an increasingly popular choice for retrofit or restoration projects. 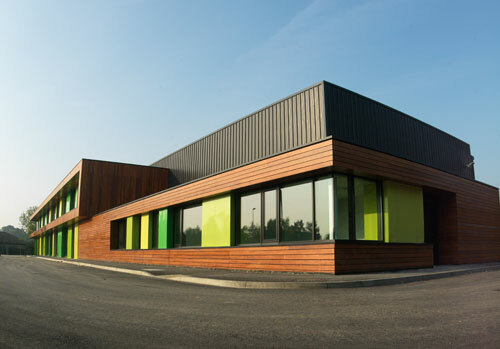 Unlike brick or blockwork timber cladding can be supplied ready painted in a wide variety of colours which offers architects greater design flexibility. Properly sourced timber from certified sustainable forests also offers an environmentally friendly choice of product. The use of certified timber in building projects will become increasingly important as we move towards 2016 when Code Level 6 under the Code for Sustainable Homes will be required for all private housing projects. Western red cedar is the most popular species due to its durability, stability and appearance, however we continue to see a growth in the use of Thermowood (a heat treated modified wood) and Cumaru (South American hardwood) which are both suitable alternatives. Our Siberian larch also continues to be a popular economical choice. As demand for timber products has grown,we have seen the price of timber increasing over the past few months and inevitably this rise in raw material cost will feed through to the consumer. For further information or advice call our expert sales team on 01472 350151 who are always willing to help with any cladding query.